Since many legal disputes are battles over the meaning of a statute, contract, testimony, or the Constitution, judges must interpret language in order to decide why one proposed meaning overrides another. And in making their decisions about meaning appear authoritative and fair, judges often write about the nature of linguistic interpretation. 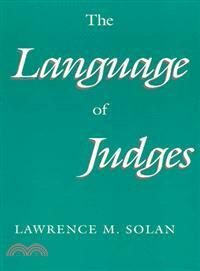 In the first book to examine the linguistic analysis of law, Lawrence M. Solan shows that judges sometimes inaccurately portray the way we use language, creating inconsistencies in their decisions and threatening the fairness of the judicial system. Solan uses a wealth of examples to illustrate the way linguistics enters the process of judicial decision making: a death penalty case that the Supreme Court decided by analyzing the use of adjectives in a jury instruction; criminal cases whose outcomes depend on the Supreme Court's analysis of the relationship between adverbs and prepositional phrases; and cases focused on the meaning of certain words in the Constitution. Solan finds that judges often describe our use of language poorly because there is no clear relationship between the principles of linguistics and the jurisprudential goals that the judge wishes to promote. A major contribution to the growing interdisciplinary scholarship on law and its social and cultural context, Solan's lucid, engaging book is equally accessible to linguists, lawyers, philosophers, anthropologists, literary theorists, and political scientists. Lawrence M. Solan is a partner in the law firm of Orans, Elsen and Lupert in New York City. He received his Ph.D. in linguistics from the University of Massachusetts, Amherst, and his J.D. from Harvard Law School. He has written extensively on language and law, linguistics, and the psychology of language.